This pretty chiffon one shoulder maxi dress reminds us of a greek goddess! 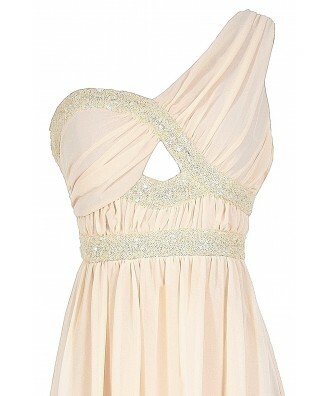 The Aphrodite Sequin and Chiffon Maxi Dress is fully lined to the mid-thigh and it made of chiffon. It has one shoulder strap that is adjustable in the back. Bands of matching sequins decorate the bust and waist of this dress, forming a unique pattern. The attached skirt is lined to the mid-thigh and has a dramatic maxi cut. Fabric ruching at the back and a hidden side zipper complete this dress. The Aphrodite Sequin and Chiffon Maxi Dress would look pretty paired with strappy heels for any formal event. Details: Fully lined to mid-thigh. Hidden side zipper. 100% polyester. Hand wash cold with like colors. Do not bleach. Low iron. Small measurements: Length from top of bust to hemline: 48”. Bust: 32”. You have added Aphrodite Sequin and Chiffon Maxi Dress in Ivory into Wishlist. You have added Aphrodite Sequin and Chiffon Maxi Dress in Ivory for Stock Notification. You have set Aphrodite Sequin and Chiffon Maxi Dress in Ivory as a loved product. 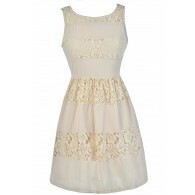 You have removed Aphrodite Sequin and Chiffon Maxi Dress in Ivory as a loved product.